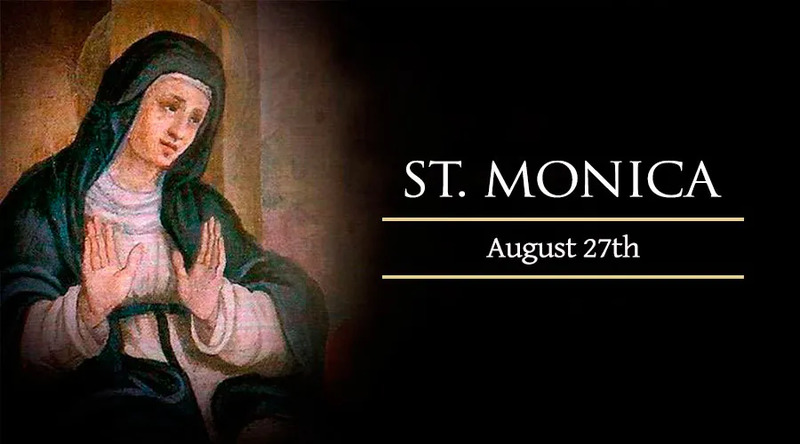 On August 27, one day before the feast of her son St. Augustine, the Catholic Church honors St. Monica, whose holy example and fervent intercession led to one of the most dramatic conversions in Church history. Monica was born into a Catholic family in 332, in the North African city of Tagaste located in present-day Algeria. She was raised by a maidservant who taught her the virtues of obedience and temperance. While still relatively young, she married Patricius, a Roman civil servant with a bad temper and a disdain for his wife's religion. Patricius' wife dealt patiently with his distressing behavior, which included infidelity to their marriage vows. But she experienced a greater grief when he would not allow their three children – Augustine, Nagivius, and Perpetua – to receive Baptism. When Augustine, the oldest, became sick and was in danger of death, Patricius gave consent for his Baptism, but withdrew it when he recovered. Monica's long-suffering patience and prayers eventually helped Patricius to see the error of his ways, and he was baptized into the Church one year before his death in 371. Her oldest son, however, soon embraced a way of life that brought her further grief, as he fathered a child out of wedlock in 372. One year later, he began to practice the occult religion of Manichaeism. In her distress and grief, Monica initially shunned her oldest son. However, she experienced a mysterious dream that strengthened her hope for Augustine's soul, in which a messenger assured her: “Your son is with you.” After this experience, which took place around 377, she allowed him back into her home, and continued to beg God for his conversion. These tears and prayers intensified when Augustine, at age 29, abandoned Monica without warning as she passed the night praying in a chapel. Without saying goodbye to his mother, Augustine boarded a ship bound for Rome. Yet even this painful event would serve God's greater purpose, as Augustine left to become a teacher in the place where he was destined to become a Catholic. Under the influence of the bishop St. Ambrose of Milan, Augustine renounced the teaching of the Manichees around 384. Monica followed her son to Milan, and drew encouragement from her son's growing interest in the saintly bishop's preaching. After three years of struggle against his own desires and perplexities, Augustine succumbed to God's grace and was baptized in 387. St. Monica died at age 56, in the year 387. In modern times, she has become the inspiration for the St. Monica Sodality, which encourages prayer and penance among Catholics whose children have left the faith.